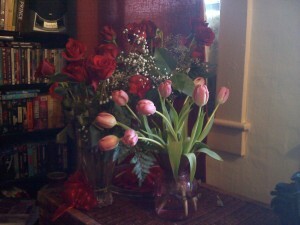 This was an unprecedented Valentine’s Day for me: I received flowers from three men. None was a husband, son, or father…. “Geeze, this place looks like a florists!” my friend Jay joked when he noticed two bouquets of red roses in my living room and the pink tulips he gave me in the bedroom. Had you told me, when I was 20, that this would happen to me at 50, I would have thought you were nuts. Back then, I believed I was too ugly for even one guy, let alone three. Real Men are funny that way. What the media says they (supposedly) find attractive isn’t necessarily what they will find attractive in Real Life. Heck , that mainstream ideal might not even be the type of person or body type that one group of men or another might find attractive. Personally, I’m more Venus of Willendorf than Venus de Milo, which doesn’t seem to matter. I don’t have fashionably long hair extensions, and I’m not walking around in painfully high heels and terribly short dresses. None of that seems to matter in the world away from media’s glare. In all honesty, the men I know aren’t necessarily Ashton Kutcher or George Clooney types either. Yes, those two are nice to look at—as, I’m sure Charlize Theron is nice for guys to look at—but do I want one in my real, everyday life? Honestly: absolutely no! If a guy might have more hair products and face cleansers than I do, he probably doesn’t know his way around some power tools. So, I’m not all that interested. A man must have more substance than style for me to want to spend time with him. He has to make me laugh and be a good, considerate lover. He doesn’t have to be pretty. Pretty is on the surface. Like all surfaces, it is easily chipped, damaged, worn down. The other traits and skills—those are more endearing and durable. So, as I sit here on my couch and look at my two dozen red roses and pink tulips, I’m thinking I just might be one of the most charmed women this Valentine’s Day, to know three real men who think so much of me. And not because I’m perfect—but because I’m just me. Sounds like you know how to find the real gems. Flowers from men who care are certainly testimony to deep and real relationships. You need to share your secrets for finding those guys and creating friendships that are about more than surfaces. Tish – Seems to me that your garden of beautiful flowers is a validation that the men in your life values a women who is smart, funny totally wonderful!